How growing in self-awareness deepens relationshipsFrom their years of counseling individuals, couples, and families, George Faller and Heather Wright show how to repair conflict, move from disconnection to reconnection, and discover God's movement in our life and relationships.They call their model NAME IT (Notice, Acknowledge, Merge, Embrace, Integrate, and Thank). To heal a relationship, first we connect with our own hearts and stories, then understand the other person's position, and finally merge those two truths (or versions of what is happening), giving birth to a new connection.By telling their own stories and those of clients they have cared for, Faller and Wright encourage those who feel disconnected not to despair in the midst of their trials but to find faith and a community to help them survive and grow. They show readers that rather than letting painful relationships leave them feeling alone and despairing, they can find hope in a deepened self-awareness that leads to richer relationships and spiritual vitality.Whether readers hope to experience the magical glow of romance, the joy of parenting, the satisfaction of community life, or a loving view of God, the NAME IT model will help them transform all their relationships. 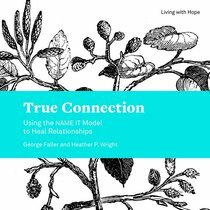 About "True Connection - Using the Name It Model to Heal Relationships (Living With Hope Series)"